Just as display monitors and screens have evolved greatly in recent years so, too, has the technology of projection. In past times, the main drawback with projection units was that, in order to produce large images, one had to sacrifice some degree of brightness and clarity by way of a trade-off. Today these limitations have been remedied by a combination of improved optics and advances in the design of screens. This improved image quality can be enjoyed with the range of Barco projectors now available. Where once the role for projection was limited to slide shows and films for educational or entertainment purposes, today their uses have extended into new industries and new technologies. Although many of these new projection applications may still be devoted to providing entertainment or learning in some form, a significant and growing role for projection in the world of advertising has created a measurable impact on sales and most major stores and shopping malls now have Barco projectors or some form of projection equipment installed. Two type of projection are in common use. In one form the source is provided by a unit placed in front of the screen designed to reflect an enlarged version of the source image as in the case of a commercial cinema. This technique is known as front projection. In back projection setups, the source image is supplied by a unit placed behind a transparent screen that, then, transmits rather than reflecting the enlarged image. 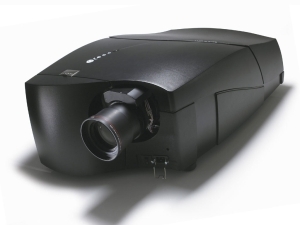 Barco projectors are available for both types of application. Back or rear projection was one of the first methods used to provide large screen images for use in the home. Instead of being rendered by a CRT, a TV receiver positioned behind a semi-transparent glass screen projects an image directly on to it. Similar but improved units remain available today although they are largely confined to company training facilities and board rooms being quite unsuitable for larger audiences or outdoor use. Among the Barco projectors available today is a range of units that employ the latest Digital Light Processing (DLP) technology. Their exceptionally bright, high definition images make them highly suitable for use with very large screens and the range includes models that suitable for screens of between 12 and 32 metres in size, making them ideal for anything from mini to full size cinemas. No presentation today is regarded as complete without visuals and developments in network centric projection now adopted in certain Barco projectors now offers presenters the perfect tool to project any type of visual material from still photos, to video clips, animations and even broadcast TV, directly from a laptop or desktop computer. Although DLP currently appears to be the future of projection technology, the role of LCD units remains a prominent and important one. Apart from being the cheaper option, the enhanced brightness and durability when compared with units using delicate, temperamental and expensive filament lamps has made them the natural replacement for the older units. Although drive-in movies are on the decline, Barco projectors suitable for outdoor use remain in demand. However, one of the fastest growing areas in today’s projection technology is that of stereoscopic 3 dimensional images. There are numerous applications of this facility in many forms of education alone and its use in providing realistic simulations for training pilots and medical students is saving time and money while achieving improved results. Parallel developments in virtual reality bring surgical training to life and even allow specialist surgeons to supervise complex procedures at remote locations that, if not undertaken due to lack of experienced staff at the site, may have resulted in the death of a patient. Whatever your field may be, contact us for full details of our range of Barco projectors and other quality audio-visual equipment.